Tripterygium wilfordii Hook F (TwHF) is a Chinese herb with immunosuppressive effects and an established history of use in the treatment of rheumatoid arthritis (RA). Numerous preclinical studies have demonstrated that the extracts from the root of TwHF inhibit the expression of proinflammatory cytokines, proinflammatory mediators, adhesion molecules, and matrix metalloproteinases by macrophages, lymphocytes, synovial fibroblasts, and chondrocytes. TwHF also induces apoptosis in lymphocytes and synovial fibroblasts and inhibits their proliferation. Except numerous uncontrolled clinical trials, there are some prospective, double-blind, randomized, and placebo/sulfasalazine-controlled trials, also demonstrating greater improvement in RA disease activity by TwHF extract than placebo/sulfasalazine. 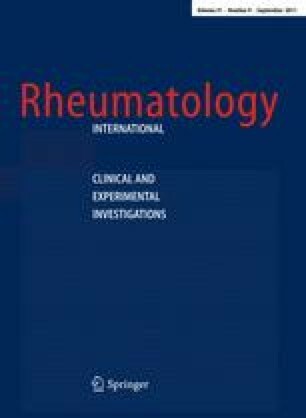 Radiographic progression in RA may also be retarded by TwHF. Therefore, the immunosuppressive, cartilage protective, and anti-inflammatory effects of TwHF extracts are well demonstrated, and TwHF extract is an alternative disease modifying anti-rheumatic drug (DMARD) for the patients with RA refractory to conventional therapy. This study was supported in part by the grants from National Natural Science Foundation of China (No. 30972729) and Shanghai Natural Science Foundation (No. 09ZR1410700).